About a year and a half earlier, Street, a church member and a retired chemical engineer, began advocating for the shutdown of a Canadian-owned oil and gas pipeline that originates on the southwestern end of Lake Superior, the largest of the lakes, on the Minnesota-Wisconsin border. From there, it cuts across Upper Michigan — in sections tracing Lake Michigan’s shoreline along U.S. 2 — through the Mackinac Straits, into Lower Michigan before it terminates in Canada. Beginning in 2016 with the Diocese of Northern Michigan, all four Michigan dioceses passed the same resolution calling on the governor and the state to dismantle Enbridge Line 5. “… the history of pipeline leaks shows that there is a significant risk of severe damage and economic loss to government entities, individuals, businesses, and the environment,” the resolution states. Together, Street and Northern Michigan Bishop Rayford Ray took the lead. In the 60-mile stretch from Naubinway to St. Ignace, the pipeline hugs the shoreline; through that area wetlands and streams feed into Lake Michigan. On Oct. 3 Michigan Gov. Rick Snyder and Canadian oil company Enbridge announced plans to replace a nearly 4-mile section of the 65-year-old, 645-mile pipeline that transports 540,000 barrels of light crude oil and natural gas a day from Superior, Wisconsin, across Upper Michigan, through the Mackinac Straits, south and east across Lower Michigan to Sarnia, Ontario, where the oil and gas are refined into propane. The governor’s and Enbridge’s agreement would create a “utility corridor,” creating a new Line 5 pipeline drilled 100 feet into bedrock below the lake bed, at an estimated cost between $350 and $500 million over seven to 10 years. The controversy involves the 3.5 to 4 miles of pipeline that carries the oil and gas through the straits’ narrow waterways. The largest strait connects Lake Michigan and Lake Huron, the third and second largest of the five Great Lakes. Pipeline opponents argue that a spill poses too great an environmental and economic risk to the entire Great Lakes ecosystem. The five Great Lakes – Huron, Ontario, Michigan, Superior and Erie – form the largest freshwater system on the planet. The lakes hold close to one-fifth of the Earth’s surface freshwater; the lakes’ watershed drains 200,000 square miles of land, ranging from agricultural to forested to cities and suburbs. They have a combined shoreline of more than 10,000 miles, touching eight states and Ontario, a Canadian province. The majority of Michigan’s 9.9 million people live below Muskegon on the western and Midland on the eastern side of the state. Remote and rural, Upper Michigan’s economy has been dependent on resource extraction, outdoor recreation and tourism; it has a population of about 300,000 people and has steadily lost population over the last decade. Pipeline supporters and Enbridge argue the pipeline helps meet rural residents’ propane heating needs. In places like Rapid River, a town of some 4,100 people about 15 miles north of Escanaba on U.S. Highway 41, where a processing facility converts Line 5 natural gas into propane, pipeline opponents make a delicate argument for its decommissioning because some residents work at the facility and love their employer. “Line 5 has inflamed our community,” said Deb Nedeau, project specialist for the Great Lakes Peace Center and a member of the Northern Michigan diocese’s Peace, Justice and Creation Care Committee. Nedeau and her business partner, Kathy Vanden Boogaard are careful to stick to the potential environmental hazards associated with the pipeline and corporate responsibility. “This is about water quality,” said Nedeau, not an unhappiness with local people. On Oct. 16, the diocese hosted a creation care conference focused on both economic and environmental justice. The conference attracted between 40 and 50 like-minded people. In April, Ray, Street and interfaith water advocates organized by Michigan Interfaith Power & Light gathered in Lansing to speak to Snyder and state representatives about the pipeline’s potential dangers. “We gathered because we believe that all of humanity is called by God to love and care for all of creation; the issue of the danger of Pipeline 5 is of grave importance to the entire Great Lakes ecosystem and to each of our communities in the Basin,” wrote Ray and Street in a piece scheduled to run in the upcoming issue of The FEAST, published by the Diocese of Eastern Michigan. “In the Episcopal Church, we believe that we are stewards of creation; called to pursue justice and peace for all people and to care for the world God has given us. The world we inhabit as humans and as Michiganders is in danger,” said Ray in an email to ENS. The region’s Native Americans maintain the pipeline violates a treaty granting fishing rights that dates back to 1836. Though tribal leaders have met with the Snyder administration three times over the past year as mandated, they don’t feel heard. Additionally, opponents have argued the state’s 1953 easement granted to Enbridge violates public trust law. 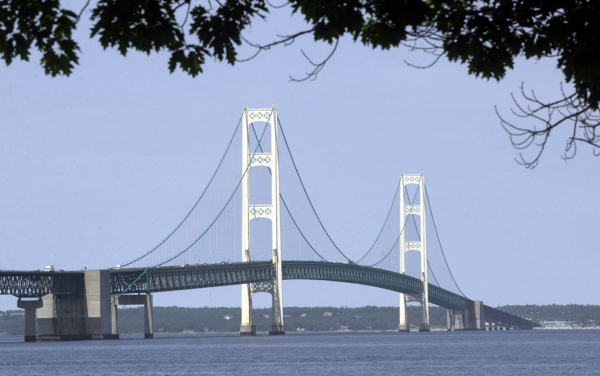 Although the state’s outgoing Republican governor and the oil company came to an agreement, the next step requires Enbridge to reach an agreement with the Mackinac Bridge Authority, which operates the five-mile suspension bridge that connects Upper and Lower Michigan over the Mackinac Straits. Michigan will elect a new governor in November to replace Snyder, who is term-limited. Two years into Snyder’s second term the Flint water crisis began to make national and international headlines; earlier this year a report found the governor partly to blame for the situation. In August, a U.S. district judge dropped Snyder from a citizen-led class-action lawsuit. The pipeline has become an election issue, particularly as the lead-contaminated water crisis in Flint still reverberates today; that, combined with the 2010 rupture of an Enbridge pipeline that discharged 843,000 gallons of crude tar sands oil into a tributary of the Kalamazoo River, has raised Michigan residents’ awareness regarding water quality issues. The Kalamazoo spill required a $1.2 billion cleanup and ongoing water-quality monitoring. Even now, Line 5 isn’t the only Enbridge-operated pipeline in the Great Lakes region to catch the attention of Episcopalians. In Minnesota, church leaders and members have joined Interfaith Power & Light’s opposition to replacing Line 3, which would run across the northern part of the state. Opponents say the pipeline threatens Minnesota’s “climate, environment and Anishinaabe people.” The Anishinaabe, aka Ojibwa, have long grown wild rice in the region. The 79th General Convention expressed its support for the Leek Lake Band of Ojibwe with Resolution C064. The post Episcopalians advocate for Great Lakes water quality appeared first on Episcopal News Service.